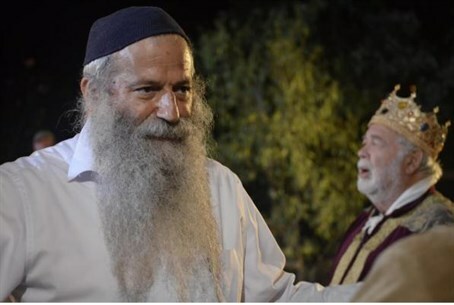 First-of-a-kind film based on Rebbe's fables, starring Yehuda Barkan, will begin screening in August. "The Stories of Rabbi Nachman,” a first-of-its-kind feature film based on four tales by the great Rebbe from Uman, will begin touring Israel in August. The film stars Yehuda Barkan, Israel’s all-time box-office champ, and winner of last year’s prestigious Ofir Award for lifetime achievement in the Arts. Its main message is that of the importance of being joyful as a basic mitzvah [commandment] in the life of a Jew: “Often we forget to live in joy, and these stories have the power to cause a person to awake from the sleep, and the routine of obeying mitzvot, to being happy – and that is the central point in these tales,” Fishman said. Fishman's film company, Shoshana Street Productions, is busy organizing screenings in communities throughout Israel, beginning in August. A listing of screenings will be posted on the movie's website, www.rebbenachmanmovie.com, which will hit the Internet next week. Before putting out a DVD, Fishman is running a grassroots campaign at http://jewcer.com/project/stories-of-rebbe-nachman-the-movie to have the film translated into six languages, "so that Jews all over the world can enjoy the film and its messages of faith, trust in Hashem, and joy." He says that people who are eager to see the film can help by organizing screenings at the community center in their communities and contacting shoshanastreetprod@gmail.com.